From the kitchen of One Perfect Bite...Information about World Nutella Day can be found here. The last recipe in this week's chocolate extravaganza comes on World Nutella Day. Nutella is the brand name of a sweet hazelnut-based spread made by the same folks who distribute the Ferrero Roche chocolates that are so popular during the holiday season. Their spread is based on gianduja, a sweet chocolate and hazelnut confection that was developed centuries ago in Turin, Italy. Gianduja is used in candy making and to flavor milk and other beverages. Many people use it as they would peanut butter and spread it on bread or toast for snacks. I don't think many would debate how delicious the spread is. There are many who would debate how healthy it is for you. Good or bad, it's here to stay and the lucky folks at Ferrero are probably delighted that their brand name is now generically used to identify most hazelnut spreads available to consumers. That's brand recognition at its best. Gianduja, which contains just four ingredients, is simple to make now that we have food processors and blenders at our disposal. Anyone who has easy access to hazelnuts or filberts can make this in a matter of minutes. I am fortunate to live in the state of Oregon where one of the major export crops is hazelnuts. That means I have a ready and relatively inexpensive source of nuts with which to make the spread. So, sometimes I do. I thought you'd enjoy seeing how it's made. 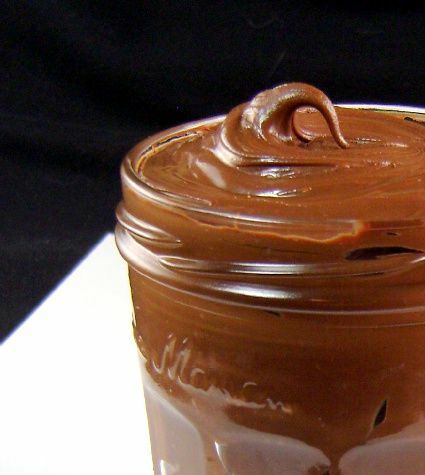 Here's the recipe for the homemade version of Nutella. Place hazelnuts in the work bowl of a food processor fitted with a metal blade. Process until nuts start to clump together in a ball. This will take some time (about five minutes), so be patient. Add powdered sugar and cocoa powder and process again for 2 to 3 minutes, until mixture turns dark and ingredients are well combined. Now, slowly drizzle in enough oil to make a spread. Store in an airtight container in the refrigerator for 4 to 6 weeks. Yield: 2 cups. My own homemade hazelnut spread? Yes, please! Mary, homemade nutella...wow...I am so thrilled to read it from my dashboard...this is an awesome and worth-to-keep recipe! I love hazelnuts and its looks so easy, unfortunately hazel nuts arent cheap here. Oh, I don't know...I'm too old to adopt. I think I just want to camp out at your kitchen table and have you feed. :) That works in my mind. I have seen many recipes for a Nutella type spread, especially on French blogs, but your recipe strikes me as not too sweet, nutty, and spectacular! Wow! Mary Love the way you make such an easy homemade hazelnut spread! A keeper! There is actually a special day for Nutella?? This looks very good, and I like Nutella, I have som in the kitchen now. I had no idea you could make it. But how silly of me. So nice, and this version is also dairy free! Homemade Nutella,I have to try this,looks absolutely superb. Good to know for sure. Your version has high hazelnut content and no mystery ingredients! Other day I was in a supermarket, picked up a bottle of choc spread, look at the contents and put it back where it belonged. Hazelnut content was few percentage! I would have thought there was more ingredients. So interesting, thanks. This is one awesome recipe!! Your homemade nutella looks wonderful! Good grief, who knew it was so simple? So, do you have a favorite brand of filberts we should know about? Thanks for sharing dear! will try it. World Nutella Day???? Who knew such a thing existed!! And who knew how easy this stuff is to make!! Thanx so much for dropping by my blog on my b-day - always a pleasure to see you!! Happy Nutella Day. We were first introduced to Nutella in our taking students to Europe days. I rarely buy it . . . but I would sure love to make it. We are going to be in Cannon Beach in a couple of weeks. I will think of you as my neighbor, while we are there. Your chocolate week has been painful to read as I've wanted them all - chocolate is the one sweet I can't resist. Thanks for the Nutella history and recipe. When I first read this recipe, I first thought you said it was based on ganja. I thought, "Oh, boy, this'll be a popular post!" Hello Mary! A beautiful version of the splendid hazelnut spread. I really like. I took down because I think it is very similar to that of Ferrero Rocher. Have a nice and beautiful day! Caroline B.
I'm curious to see how much better Nutella would taste homemade. It looks silky and delicious for sure! got an email from my darling grand daughter last night letting me know it was Nutella day(her favourite thing. I will send her your recipe. WOW I bet this is WAY better. This looks so good! I wonder if another nut could be substituted also? It might be good with walnuts or almonds. Your recipe looks easy enough to try at home! Looks delicious, and so creamy! I cannot believe this. Wow. Thank you for the recipe...no partially-hygrogenation anywhere. Oh wow, this is great! I've never even thought of making my own "Nutella"! I'll have to make it a point to try this out for sure..thanks! i can?t wait to make this! I miss "nocciole" (Italian hazelnuts) very much in the US. Happy Nutella day! Wow - I had no idea how to make it from scratch! Thank you for sharing this one! My toddler has never tried nutella because I try to keep foods with palm oil out of the house. The canola oil in this recipe makes it a treat we can all enjoy! I had no idea Oregon exported hazelnuts--good to know! There's nothing better than homemade hazelnut spread on warm fresh bread...perfect! I can not believe I have NEVER tried Nutella! I think it's because I know one spoonful and I wouldn't ever, ever stop! Very cool to see how they make it! Thanks Mary! Chocolate hazelnut spread is a dangerous thing to have in my house- I'll eat it all up!!! Mary - I can't believe that's it! The Nutella people are going to be in big trouble now - their sales are dropping as we speak. LOL. I had no idea that hazelnuts were an Oregon export. Hmm... you learn something new every day. I've never had Nutella!! Whew, glad to get that off my chest. I love chocolate and hazelnuts (not so abundant and cheap here) and can see how they would be delicious "married" in this way. I will have to try this one, since my wife is a Nutella addict. Hi, Mary! What a delicious jar of goodness! So beautiful and decadent! I had to bribe my children to try Nutella this summer...and they were't impressed...can you believe that? I think I could tempt them with your fabulous homemade version, though. Thanks for sharing! The Great Dane wants to celebrate World Nutella Day with a piece of toast with cheese and nutella. He is a fan from waaaaay back and taught the children about the pleasure of this spread many years ago. Do you know that in Denmark it's quite common to find wafer-thin sheets of chocolate on the breakfast table. I've never been able to adapt to the idea of chocolate on toast, but I can see that it makes lots of people in my family happy! WOW! What a great recipe Mary... I'll give it a try for sure! so yummy! i would never think to make my own hazelnut spread. i bet this is way better then the store bought stuff! Oh Mary Mary Mary what can I do with you? and where they will stop my sugar (diabetes) with these delicious things you made. Mary, thanks for visiting my blog! It is wonderful to know your blog, the recipes here are lovely, hope you don't mind I create a link to your blog. Have a great weekend! Oh mary that is perfection! I love the small ingredient list and can't wait to make this. My first taste of Nutella was in Paris, I ordered a crepe with chocolate and bananas. It's been true love ever since! So good...what a great, easy recipe. I'm not sure if I could be trusted to whip this up in my kitchen though. The quality control taste tests would take out at least 1/4 of the batch...ehehehe. A very valuable and nutritious recipe. I make it with cacoa and agave but little differece. Your pictures look so nummy. Have a marvelous week end. Happy World Nutella Day! If I had that kind of access to hazelnuts I would probably make this all the time! I love the simplicity of your recipe. I have made homemade Nutella also, and I was surprised that it was so easy! Delicious! I did not know these facts. And you can make it homemade? Get out! Sounds wonderful. Oh Mary - you just made my day. I can't wait to give this recipe a try! One of our friend's sister in India was married to a German,and she introduced us to Nutella in the 90's when nutella in India was an ,"imported product"My daughter had instantly taken to the spread on a toast,I have still not warmed up to that idea and perfer to have mine by the spoon;) Thanks for sharing this decadently yummy recipe,I had no clue it would be this simple. wow, I can't believe you made your own - this look heavenly! Hi Mary, thanks for linking to my cupcakes! Your homemade nutella looks divine, it's never occurred to me to make it myself. Happy Nutella Day! I just made waffles and my son wanted nutella. I wish I had this recipe and make my own, instead of give him store bought. That's amazing. I've made my own peanut butter before, but never thought about making Nutella! How could I have missed this who nutella day??? I LOVE nutella! And your version looks just lovely! The nutella looks unbelievably creamy, and I love the simple recipe for it! I've been eating Nutella all week, and I didn't even know about Nutella Day! Dang that looks good! I think I'll make it and fill a cake with it! Anyhoo, I wanted to thank you for all your nice comments! I have added your site to my favorite blogs list on my page! I love nutella and enjoyed reading your post. Your homemade version looks amazingly delicious. Thanks for visiting my blog earlier and leaving nice comments. I was honored. I don't know where I have been, but I am so happy to get to know your amazing blog. I am now following. You know how I love that crazy Nutella! Thanks for linking my blog and cake! Now I just need to get my hands on some hazelnuts! I love Nutella (who doesn't these days?) but I've never thought of making my own. I love the idea! Thank you for sharing, sweet friend. May your Sunday be one of peace and love. Hey Mary, thanks for visiting my blog and being so kind to leave such nice comment. I followed your link and browsed your blog. You have a wonderful web, and lots of followers. I wonder how you get so many follower on your blog? I love Nutella and I'd love to try this homemade version. Thanks so much for sharing! how ridiculously easy! I have to make some for myself. homemade nutella? I bet it is incredible. I have to give this a go. The recipes sounds simple. This is the easiest recipe I have found thus far - and I've found a lot. You know how to end a chocolate month! 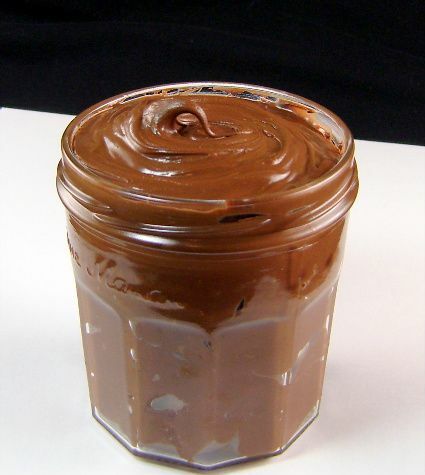 OMG, I love Nutella and it looks fairly easy to make. I recently found crunchy Nutella in the store and I got so excited! Looks amazing...something I'll have to try very soon. I'm sure it's delicious! Now I'm the sorry one Mary. I can't believe I almost missed World Nutella Day & celebrated Chocolate Fondue Day instead. omg!!!! this sounds sooooo yummy!!!! It's that easy?! I am so glad that I finally broke down and got a food processor a few years ago. I am definitely going to make this. Thank you for sharing the recipe. That looks positively amazing. I have seen this around but haven't tried it yet! I first heard of Nutella when visiting my relatives in Italy. They eat it like pb&j. You are really making me drool with all of your great recipes so far this February. Just the other day Hubby and I were discussing how turned off we were with the commercial Nutella due to the high sugar content. He asked me why I didn't make my own. It was a very good question...and now, I have your recipe to inspire me to surprise him. We all love Nutella and it goes quickly. I really must try your homemade version. HA! I just found your blog (followed the link from FB) and when I saw your header picture, I fell in love. My husband often makes fun of me (in a loving way) that I am the Queen of the perfect bite which is why it takes me so long to eat! I'm gonna have to try this homemade nutella because it does go quickly in our house and must be cheaper than buying it premade! Thanks and looking forward to reading more of your blog! Looks great. Any sugar substitute you could recommend that would work well? OMG, thank you for the recipe! I'm a newly converted nutella addict. Got my first jar last week and have been fighting the urge to eat it by the spoonful. I have found that's it's really tasty on graham crackers, and a friend suggested using nutella instead of chocolate to make s'mores. Thanks for the recipe and speaking of filberts, you ever try roasting fresh ones over the firepit til they get all smoky flavored and hot. LUSCIOUS!!!! Sadly, we're on the "other side of the mountain" so we have to make these crazy dashes to your side to stock up. I came across this recipe on pinterest.com. I LOVE Nutella! I cannot wait to try this recipe. And it looks so easy! Awesome, thanks for the recipe! Is there another oil besides canola that I can use? I found out canola is not healthy. Thank you! great , but my came out lumpy,not smooth. I blended for more them 30 min in the food processor. Could it be because I used hazelnuts with skins, or maybe they won't toasted. Evelyn, the nuts should be toasted and skins removed. I just made this recipe and here's what I've found. 1. After you toast the hazelnuts, you need to remove as much of the skins as you can by rubbing the nuts vigorously in a clean kitchen towel. 2. You can't process the spread enough in the food processor to get the creamy, non-gritty texture that comes in the jarred version. If that bothers you, you can push the spread through a fine-mesh sieve which will help a lot but it won't be perfect. Its fine by me, but I'm not sure what my kids will think. 3. This is more time and work than it appears, but my be worth it to you if you love the end result. 5. This homemade version is well suited to adult tastes that aren't just looking for a sweet hit. It's more complex. That being said, it will never be mistaken for store-bought Nutella. 6. I found that for a flavor and consistency more akin to Nutella, I had to add considerably more powdered sugar, and about 1 1/2 tsp. of vanilla, along with about a 1/4 tsp of salt (which brings out the chocolate flavor more.) I also added a bit more oil for a creamier consistency. I haven't tried this on my kids yet who are die-hard Nutella fans (and I rarely buy it for them), so we'll see what they say. Bottom line, I think this is a good Nutella alternative or replacement but not a copycat version. I have to be honest. This recipe was dreadful. I usually love home made alternatives but this tastes NOTHING like Nutella. This was a waste of expensive hazelnuts and expensive high-quality cocoa. Unfortunately, it's probably the worst recipe I've ever tried. This doesn't taste, look, or feel like Nutella.